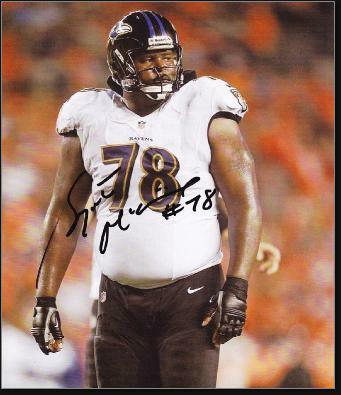 Bryant Douglas McKinnie was born September 23, 1979 in Woodbury. Big, strong and athletic, he had already surpassed 6 feet and 200 pounds by the time he made the Woodbury High football team as a defensive lineman at the age of 13 in 1993. He flourished under head coach Jim Boyd and assistant Zack Valentine, a former Pittsburgh Steeler. Bryant also competed for the Thundering Herd’s track team, throwing the shot and discus as well as running the 400 meters. Bryant stood 6’8” when he graduated but lacked the body mass to succeed in a Division I football program. He played two seasons for Lackawanna College in Scranton and, during his time with the Falcons, packed on 70 pounds and switched from the defensive line to the offensive line. Bryant was named team captain and led the team to a pair of conference championships. After sorting through offers from Penn State, Iowa, Syracuse and other top schools, Bryant accepted a scholarship from the University of Miami and after red-shirting in 1999 played a key role in the Hurricanes’ success in 2000 and 2001. They lost just one game during that time, finishing #3 in 2000 and defeating Nebraska 37–14 in the Rose Bowl to secure the 2001 national championship. Bryant, who played left tackle and often lined up next to tight end (and roommate) Jeremy Shockey, was first-team All-Big East and a first-team All-American both seasons. He did not allow a single quarterback sack in his career. In 2001, he won the Outland Trophy and was in the running for the Heisman, finishing #8 in the voting. He was selected by the Minnesota Vikings with the 7th overall pick in the 2002 NFL Draft. Bryant’s pro career had its share of ups and downs. He was a solid performer for the team, starting 80 consecutive games during one stretch and making his one and only Pro Bowl in 2009. He passed up the chance to play in the game because of assorted injuries but neglected to tell the league in time, and was hit with a heavy fine. In 2005, he was implicated in the team’s “Love Boat” scandal and in 2008 was arrested after an altercation with a Miami nightclub bouncer. In 2010, he allowed the sack that ended Brett Favre’s consecutive game streak at 297. After nine years on the Vikings’ offensive line, Bryant got his walking papers when he reported to training camp in 2011 overweight and out of shape. Ed Reed, a teammate on the ’Canes, urged the Ravens to sign him. Bryant was the starting left tackled on the 2012 club that won the Super Bowl. That year, Bryant was inducted into the University of Miami Sports Hall of Fame. The Ravens dealt Bryant to the Dolphins during the 2013 season. He had lost a step by this time and it showed. The left side of the O-line was a weakness for Miami all season. It was Bryant’s last in the NFL.